The service shall examine how digital health solutions and policies in stakeholders’ territories foster the development of data-driven healthcare and digital health services, identify existing and potential opportunities and challenges to cross-border movement of health data and prescriptions and propose policy recommendations. In particular, the objective of this activity is to examine how eHealth solutions can be developed and promoted in the evolving landscapes of technology, territorial governance and cross-border cooperation in the stakeholders’ territories. The targeted analysis should identify best practices as well as legal, public policy and other challenges and opportunities to digitalization in health sector. Results will also be used by stakeholders as input to implementing their ongoing and planned eHealth policy developments and reforms. How are digital healthcare solutions implemented in stakeholder’s territories? What kind of policies have been put in place in order to facilitate and implement digital health solutions? What are the key driving forces and potentials, challenges and obstacles for data driven future healthcare in stakeholder’s territories? What is the situation with cross-border data governance, data models, legislative, political, cultural, economic, technological and other relevant aspects contributing to digital service development in the healthcare sector? How do the legislative, political, cultural, economic, technological and other obstacles apply also to digitalisation in sectors beyond eHealth (potential transferability of research findings to other sectors than eHealth, e.g. education, urban planning, any other public service sector)? What evidence can be found on the impact of digitalising services in health sector in stakeholder’s territories in terms of economic and social benefits? How could the radio frequency regulations in the European and national levels promote future digital health services by making use of the available spectrum more efficiently and intelligently, including different spectrum sharing techniques? What are the good practices in delivering digital healthcare solutions that can be transferred to other EU territories for policy development or for helping to design future digital and data-driven health solutions? 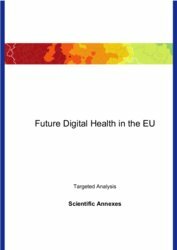 How to promote and support future digital health developments, foster new technologies and cross-border movement of health services and data in EU in terms of legislation and policies?